Steve Van Doren irreverently wrapped the black granite facade with black checkerboard (photo by Eric Laignel). One of Southern California’s most iconic companies has new headquarters, a collaborative complex in the heart of Orange County that reflects the brand’s spirit. The 1950s and ’60s may be distant memories, but rock ’n’ roll, surfing and skateboarding still represent the essence of the Southern California lifestyle, and no single brand captures that ethos better than Vans. Reflecting the spirit of SoCal in a shoe, the appeal of the company’s products transcends economic strata, ethnic identities and generations. Vans recently passed the half-century mark. Attesting to the timelessness of the designs are its Old Skool sneaks, which despite debuting in 1977 as “Vans #36” are currently favored by Stella Maxwell, Kendrick Lamar and virtually the entire Kardashian clan. Also still offered are the iconic black-and-white-checkered slip-ons worn by Jeff Spicoli (Sean Penn) in the 1982 classic Fast Times at Ridgemont High and an extensive collection of stock and custom products that resonate with celebrities including Justin Bieber, Rihanna and Gigi Hadid. For a company founded when LBJ was in office, Vans has maintained a surprising degree of street cred throughout the years. Founded by brothers Paul and Jim Van Doren with partners Gordon Lee and Serge Delia in 1966, the company initially dispensed shoes to customers from a small manufacturing space in Anaheim. 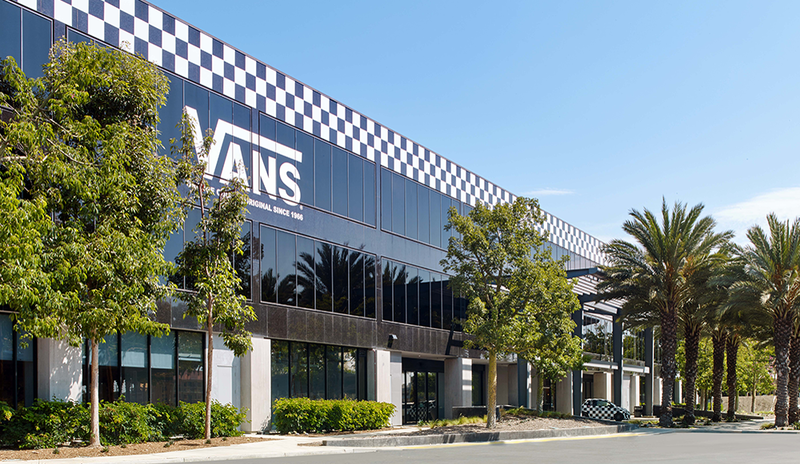 Throughout its history—from rapid expansion to bankruptcy, subsequent renaissance and global prominence—Vans has diversified but has never forgotten its Orange County roots, now represented by distinctive new headquarters in Costa Mesa. Known for its sticky soles and originally known as the Van Doren Rubber Co., Vans now has wide-ranging lines of shoes, apparel and accessories accommodating the needs of skateboarders, snowboarders, BMX racers and surfers. Though celebrities have adopted the brand, so have soccer moms, millennials and aging boomers who haven’t touched a board in decades. 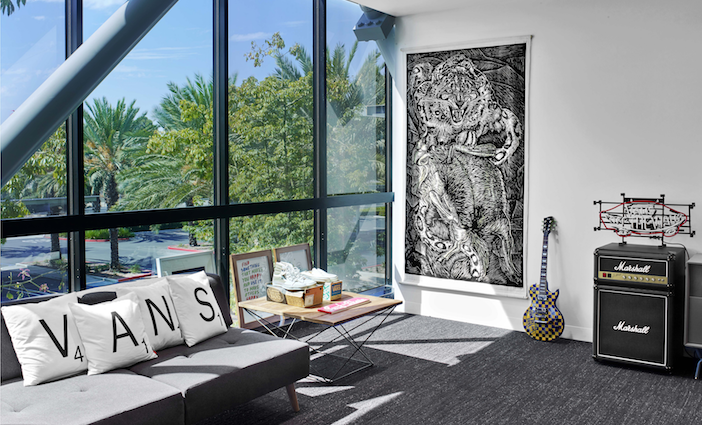 Collaborations with organizations as diverse as Marvel Entertainment and the Van Gogh Museum in Amsterdam result in vibrant, relevant new designs that only enhance the brand’s worldwide following. Vans’ parent company, North Carolina-based VF Corp., which acquired the shoemaker in 2004, also owns a myriad of other iconic brands. Some, such as Wrangler and Lee jeans, Dickies workwear, and outdoor apparel brands North Face and Timberland, also have major cultural significance. Vans’ first stand-alone retail store was in Costa Mesa; after moving from Anaheim to Santa Fe Springs to Cypress, it was fitting to return there in 2017, opening its HQ not long after the company’s 50th anniversary. President’s Office (photo by Eric Laignel). According to Cheryl Van Doren, vice president of human resources and daughter of co-founder Paul Van Doren, the company had been seeking a suitable location in Orange County, preferably not far from the beach, which is integral to the company’s heritage. “Costa Mesa is a community with a passion for the action-sports lifestyle,” she says. The availability of a freeway-convenient, campus-like setting with sprawling central courtyard made the move a no-brainer. Minimalist and art-laden, the building houses more than 500 employees. It consists of a collection of stylish collaborative spaces and possesses a hip quotient worthy of Vans’ place in the region’s cultural heritage. Rapt Studio, an architecture firm that created work environments for other brands such as HBO and Fender Guitars, provided Vans with a unique sense of identity honoring its renegade roots. Located on a 15-acre site opposite the South Coast Collection retail and dining center, the 182,000-square-foot facility accommodates the four pillars of the Vans corporate psyche: art, music, action sports and street culture. “Rapt was able to translate all of our input into a workspace that is able to enhance creative thinking and collaboration,” Van Doren says. All working areas are designed around a central courtyard featuring a prominent red staircase that doubles as a massive sculpture. “The staircase is not just to connect the floors but to bring people out, into the open, to be seen, and to see—to run into people they normally wouldn’t—to interact with ‘the family,’” says Rapt Studio CEO and chief creative officer David Galullo. 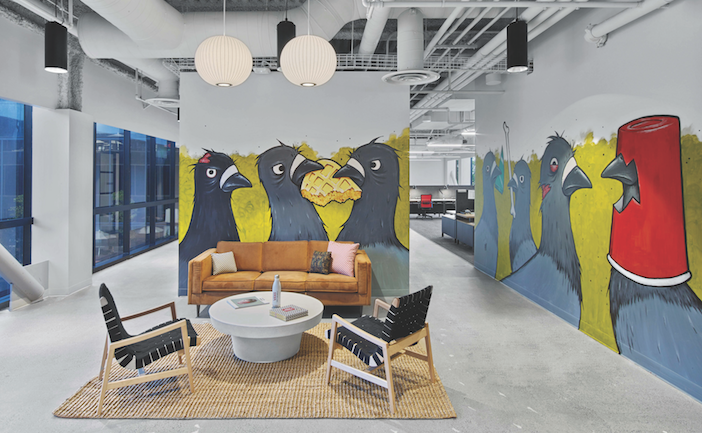 Conversations about projects or marketing campaigns that begin on the stairway can be continued in the courtyard, at an umbrella-shaded table or on cushy lounge chairs flanking a surfboard-shaped coffee table. 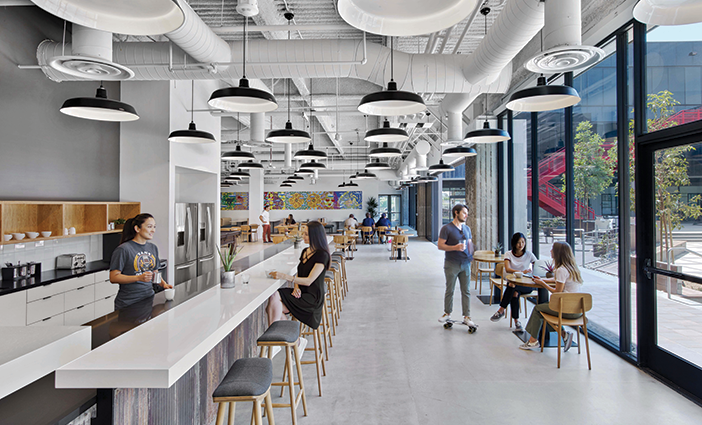 The open-plan working environment—nary a cubicle is found in any of the wide-open spaces—features whitewashed walls and ceilings with exposed ducts and plumbing illuminated by industrial-chic lighting fixtures. Art installations and modernist furniture that employees settle into with laptops provide splashes of vibrant color. A proponent of flex schedules and of working remotely, Van Doren and company provide Vans employees an environment that suits the brand’s casual image while maintaining the creativity and productivity required to fuel a global footwear and apparel powerhouse. An on-site barista dispenses organic fair-trade coffee in the Commons; the appeal of Vans Shoes transcends economic strata, ethnic identities and generations (photo by Eric Laignel). Opening up to the courtyard and reminiscent of a college student union is the Commons, offering games, lounges, flat-screen TVs and an on-site barista dispensing organic fair-trade coffee. A yoga room offers spin and meditation classes, and there’s a well-appointed gym. Another corporate perk allows dog owners to bring their pets to work on Fridays. Though a room is provided for employees to store their bikes and surfboards, personal skateboards need not be stashed, since skateboarding is an accepted mode of transportation throughout the building, encouraged by smooth concrete flooring. Rapt reports, in fact, that this project is the first in the firm’s portfolio that includes a skateable concrete bench in the reception area. Reinforcing the sense of community is a glass-ensconced corridor that rings the courtyard on each level, allowing free flow of traffic without disrupting workers. Rapt refers to the areas within the circulation ring as “working neighborhoods.” More formal workrooms accommodate brainstorming and conferencing. For private conversations, staff members retreat to a huddle room, for silence to the fashionably appointed library. The essence of the brand’s value of expression is respected in the design. Conference rooms are named after Vans-sponsored athletes and filled with their personal memorabilia, such as a rookie-year pair of shoes or an old surfboard. Walls by the second-floor marketing department are lined with vintage wooden skateboards from the 1950s and ’60s, a museum-like collection that extends into a large conference room. A mock retail store—a place for testing out new shelving or window displays—is designed to elicit feedback from colleagues. For recreation, there is a space for employees to make their own music—drums, for instance, and keyboard provided. As part of the “Shoebox Series,” says Van Doren, “we showcase up-and-coming musicians, and employees can go in there and jam for a while.” They can also just let their hair down with a game of darts and selections from a vintage jukebox. In addition to recharging at the Commons on the ground level, there is a second-floor coffee area and newly created rooftop terrace for work or leisure. The rooftop is where Steve Van Doren—Cheryl’s brother, vice president of events and promotions and son of co-founder Paul Van Doren—might be found barbecuing for staff or guests. In the parking lot, a vert ramp accommodates freestyling skateboarders between business meetings. The building is LEED Platinum-certified, a designation reserved for the most eco-friendly structures. Providing about 50 percent of the building’s energy needs are 4,000 solar panels; 38 electric-vehicle charging stations in the parking lot encourage employees to reduce their carbon footprint. To conserve water, a prominent fountain was drained and converted into a pedestal for a sculpture designed as a tribute to skateboarding. As Vans’ vice president of global creative, Jamie Reilly is responsible for the look of its retail stores, website and advertising. He was on the team that formulated the concept and aesthetics for the new digs. “The challenge was how the headquarters design could represent who we are but also be a collaborative space in which to showcase the creativity we’re known for,” he says. Suggesting that the same can be said for the skateboarding culture that elevated Vans as a brand, he says, “It’s now widely accepted in America as suburban moms drop their kids off at skate parks.” Nevertheless, he notes, in some of the company’s markets, such as China, the activity remains largely underground. “Like moving into a bigger house, we’re still in the process of decorating and are constantly looking for artists that align with our values,” Reilly says. There are plans to exhibit art created by employees as well. Mural by Todd Francis (photo by Eric Laignel). A diverse collection of art has been assembled, including murals by longtime collaborators Todd Francis and Jay Howell as well as nature- and mathematics-inspired artist Katy Ann Gilmore. 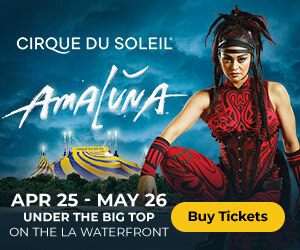 Other contributors include photographer Edward Colver, who documented the L.A. punk rock scene in the ’80s, and graphic artist John Van Hamersveld, who created the movie poster for the epochal surfing film The Endless Summer. Human resources executive Van Doren suggests that new cultural and ethnic influences are part of the natural progression of the brand. That diversification, while staying true to its SoCal roots, is reflected in the corporate headquarters building. “People feel good in the space; they feel like the space is theirs, and they feel really proud of it,” Van Doren says.